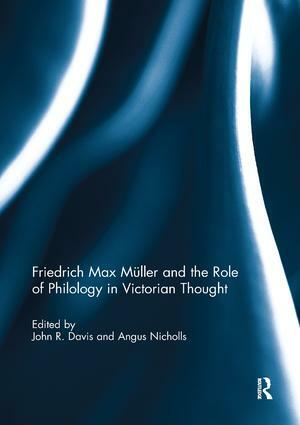 The German comparative philologist Friedrich Max Müller (1823-1900) was one of the most influential scholars in Victorian Britain. Müller travelled to Britain in 1846 in order to prepare a translation of the Rig Veda. This research visit would turn into a lifelong stay after Müller was appointed as Taylor Professor of Modern Languages at Oxford in 1854. Müller’s activities in this position would exert a profound influence on British intellectual life during the second half of the nineteenth-century: his book-length essay on Comparative Mythology (1856) inspired evolutionist thinkers such as Herbert Spencer and Edward Burnett Tylor and made philology into one of the master sciences at mid-century; his debates with Charles Darwin and his followers on the origin of language constituted a significant component of religiously informed reactions to Darwin’s ideas about human descent; his arguments concerning the interdependence of language and thought influenced fields such as psychology, neurology, paediatrics and education until the end of the nineteenth century; his theories concerning an ‘Aryan’ language that purportedly predated Sanskrit and ancient Greek led to controversial debates on the relations between language, religion and race in the Indian subcontinent and beyond; and his monumental 50-volume edition of the Sacred Books of the East helped to lay the foundations for the study of comparative religion. Müller’s interlocutors and readers included people as various as Alexander von Humboldt, Darwin, George Eliot, Matthew Arnold, Friedrich Nietzsche, Ferdinand de Saussure, Ernst Cassirer, Mohandas K. Gandhi and Jarwaharlal Nehru. This volume offers the most comprehensive and interdisciplinary assessment of Müller's career to date. Arising from a conference held at the German Historical Institute in London in 2015, it brings together papers by an international group of experts in German studies, German and British history, linguistics, philosophy, English literary studies, and religious studies in order to examine the many facets of Müller’s scholarship. This book was originally published as a special issue of the Publications of the English Goethe Society. John R. Davis is Professor of History and International Relations at Kingston University, UK. His research covers Anglo-German relations and British and German history. Angus Nicholls is Reader in German and Comparative Literature at Queen Mary, University of London, UK. He is co-editor of the Publications of the English Goethe Society and of History of the Human Sciences.